You are about to meet some people you really can't forget, people whose ambition and effort have allowed to overcome great obstacles on their way to professional success. They come from diverse backgrounds, sometimes challenging backgrounds. Today they will share their stories with you. Their stories demonstrate in a powerful way how much can be achieved through motivation, hard work, and education. I know. More than 60 years ago continuing my education, and even entering high school or college was invaluable for me. My parents were from Mexico, farm workers. My father died when I was six. Two years later I became deaf from spinal meningitis. Helping my mother hold together our family of seven children was important to me, but my education was important also. I left my family to go and live in a residential school for the deaf, and fulfilled a lifelong dream, an almost unheard of dream for a Hispanic deaf person in those times-- to graduate from college! Positions in higher education and government followed after I received my degree. Today, I am proud to lead the finest technological university in the world for young men and women who are deaf and hard-of-hearing, the National Technical Institute for the Deaf, NTID. One of the most important goals this college has undertaken this past decade is its affiliation with the Northeast Technical Assistance Center, NTAC. This government-funded program, based here at NTID, has its own dream for young deaf and hard-of-hearing people, to ensure that anyone who chooses post-secondary education will have all the support and services needed to succeed. As you watch this videotape, I hope that you will be inspired to follow your own personal dreams. With hard work, desire, and belief in your own dreams, you, too, can achieve your goals. Good luck to you! NARRATOR: An hour away from the old world charm of San Juan, Puerto Rico, in the small town of Manati, is the practice of Dr. Angel Santiago. There is more, however, to this modest practice than meets the eye. 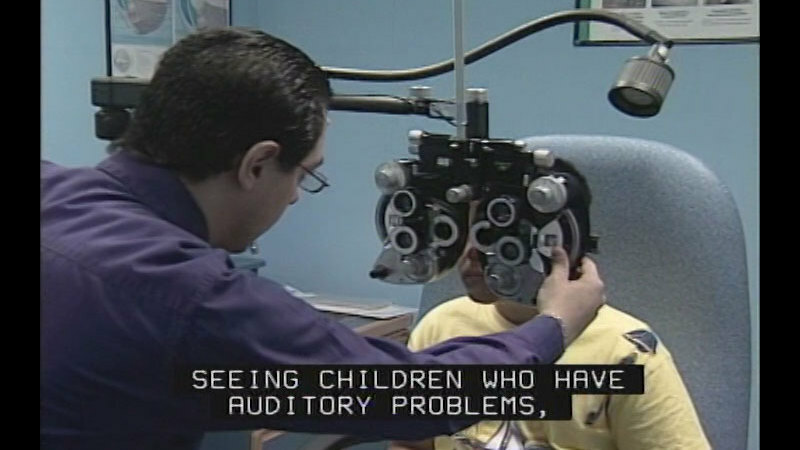 Dr. Santiago, an optometrist with a hearing loss, has assembled a unique team of professionals, including a speech therapist, a speech pathologist, and a psychologist, who specialize in healthcare for Puerto Rico's disabled population. Patients with vision loss, hearing loss, mental or developmental challenges, are welcomed and treated with care and respect. Dr. Santiago has earned the thanks of hundreds of patients who are grateful for his services. I think what Dr. Santiago is doing here is so important for Puerto Rico, because people who have special needs are going to find a place where the services are integrated. What I mean with this is if you have, for example, you can't hear well, but then you have problems with your family because they can't accept you the way you are, not only are we going to see the problem with your vision or the problem that you don't hear, we can look for something you can use and then listen, but we're going to give you the opportunity to have sessions, psychological sessions. It could be individually, it could be a group, it could be with your family, so they can understand and accept you. NARRATOR: Kimberly dodge was born hearing, and grew up in a small Midwestern town in Michigan. When she began kindergarten a hearing loss was detected, and by the time she was eight she was completely deaf. Kim was mainstreamed in elementary school and high school, and later graduated from Michigan State University. Looking back, Kim realizes that it was her own independent spirit and persistence that enabled her to take charge of her situation and enlist the support of family, friends, and teachers to help her succeed in school. By the time she was in eighth grade, she knew that she wanted to work with animals. She thought it would be interesting to combine her love of medicine and animals by becoming a veterinarian. Now, Dr. Kimberly Dodge, emergency veterinarian, works at the Connecticut veterinary center in West Hartford, Connecticut. Although she's miles away from her Midwestern upbringing, the can-do spirit instilled in her as a young girl is very much alive. INTERPRETER: I went with my parents to the vet with our cat one day, and that's where I got the idea that doctors can work with animals, too. I liked that better and I thought, wow, I really could enjoy doing medicine and work with animals, and I thought that was a cool option. OK, she looks very healthy, though. She looks very good. What I'm gonna do is I'm gonna send some medication home with you, and give her one time a month, OK? And if she's negative, then you can go ahead and straight give it to her. All right. Do you have any questions? INTERPRETER: I also realized that people are a big part of what we do. You can't avoid the people interaction because who brings the animal is a person, and you have to deal with that person. You have to be able to deal with people well, or you need to improve your people skills. I'm working on that now. And you have to be willing to work hard. It's a lot of work, but I think it's a lot of fun, too. There's a lot of rewards. But I've gotten very positive feedback from my deaf clients, saying that it's easy for them to communicate with me. Therefore, they ask even more questions because they'll understand the explanations. Clients are actually in awe at how much she can present as a doctor. And she has a good rapport with clients, they love her, and they love her because of her thoroughness, they love her because of her knowledge of veterinary medicine, and her communication with the client is not hindered because she is deaf. She likes emergencies. I think she prefers emergencies which are higher anxiety. She really likes the stimulation of many new things presenting on different nights, and being able to assess and deal with very different problems. She's very good at it. INTERPRETER: During surgery, we've taught the staff to work a little bit more with their hands, to gesture more, because obviously with masks on during surgery, you can't communicate like we talk normally. She has earned respect, big respect around here, and her medical skills, her surgical skills, they're impeccable. And you just think of all the extra work that she has had to do to come where she is, you just can't help but respect, and she's earned it, and we give it to her, I give it to her, she gives it back, though. INTERPRETER: I have a stethoscope right now that has a visual display on it, and you can see kind of a line following the rhythm of the heart, which is OK. One of the problems with that is doctors can tell their clients to hold their breath and release it, but a dog is always panting and it ruins-- really ruins-- the wave. 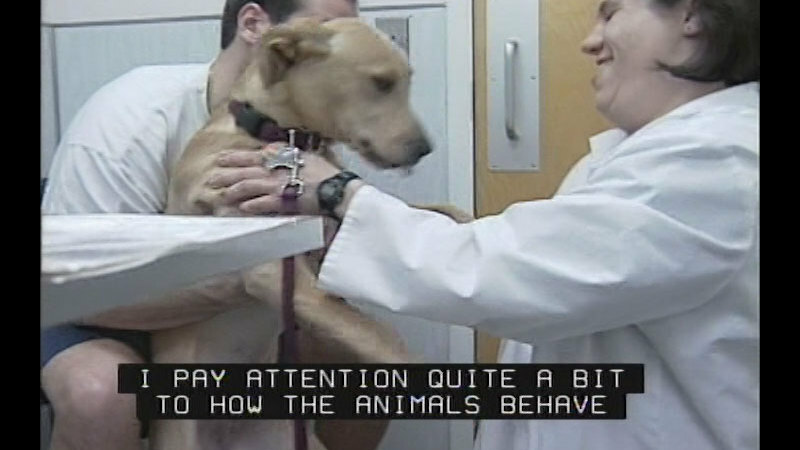 I did teach myself while I was in vet school to palpate the animals using my hands. I can put my hand on the animal's body and can sense sound in the different sounds between the lung, the heart, and the abdomen. I pay attention quite a bit to how the animals behave in what they're doing. There's always something going on and you don't know what's going to be coming in the door next. You don't know the background of the animal, and you don't know what happened. You just have to figure it out right now. And to figure it out, you have to help the animal and explain it to the owner, and I like that challenge. I became a person who does surgery here because what other job can you come to work, wear your pajamas, play with puppies and kittens all day, and get somebody else to clean up the mess? INTERPRETER: You should not let people tell you, you can't. People don't know. There are so many people who told me, you can't do this and you can't do that, and they didn't know. Find other ways to do it. Just because nobody knows a way to do it doesn't mean that there's not a way to do it. That's a different thing. And if you're willing to be flexible, and if you're willing to learn, and if you're willing to explore a little bit, then encounter a lot of frustrations, I think at the end, it's worth it. I like where I am today and I enjoy my job. I enjoy what I'm doing and I don't regret any of it. Being a vet is dangerous. People don't think about that. I've been in situations where I've had 2000-pound bulls chasing me. I've had situations where I'm dealing with rottweilers. They're big dogs that refuse to let me near them, and I've had to treat them. You learn different techniques and different drugs. That really helps, and you learn to run really fast. INTERPRETER: As a kid, for sure I thought something was seriously wrong with me. I was scared. I thought that my future was so limited, I had no home. At the age of 13, Claudia moved to the United States and attended the Lexington School for the Deaf in Queens, New York. It is here that she met her first deaf role models and her self-confidence began to soar. She participated in sports and developed an interest in law. She believed, having been subject to discrimination herself, that becoming an attorney might allow her to make a difference, and it did. She graduated with honors from Howard University, American University, and Washington College of Law. Today, she is a practicing attorney in Washington DC. INTERPRETER: I decided to choose law, become a lawyer, because I felt like a law degree would give me that necessary tool to empower people and to fight for them and to give them a voice. And to educate them as to what their rights are, how to react, and when they face that discrimination, what do you do? More or less hearing, or not really, like deaf or blind? INTERPRETER: But I went to the Lexington School for the Deaf and involved myself in everything I could. I became involved with volleyball, track, I was president of my class and president of student government, the first black student government president at Lexington ever. That's where my world really opened up, because up to that point, I never really had met other deaf people, and when I came to Lexington, I saw other people who were the same as me, and they were deaf, and that meant a lot to me. I would say, a shining star. Why? Because no matter what she does, she tried to do her best at it, and also, she just shined. She was able to incorporate other people in whatever she was doing. She was able to help people and to just shine with them. INTERPRETER: I also saw other people who were deaf, but they were teachers. They were real professional people within society having a regular life. And finally, I realized that my life did have a meaning to it, and I feel it's part of my job as a deaf person who can communicate in their language to go out to the people and be involved in those communities and educate them. So we have a job, me as a lawyer, not only to enforce the law and apply the law, but also to help people modify their attitude about other people with disabilities to eliminate misperceptions and stereotypes and stigmas. And of course, overnight, society is not going to change, because you're changing attitudes and you're changing issues and views, but we have to work on changing people's attitudes and help people realize who is responsible for what, and help realize the people who have-- help people with disabilities realize that they can participate, that they should feel equal to other people. Speaking of attitude, I was very driven by the desire to try and change people's attitudes within society, because I see how much the law itself becomes meaningless if we can't modify people's attitudes about people with disabilities. I recently graduated from law school to become the first black deaf woman lawyer. People say it's amazing you have overcome your disability. What I've done is overcome the superficial barriers created by society. Now I couldn't let anything be wasted. I had to take advantage of everything that became available to me, and through that, I had grown so much, and now that I've accepted being deaf and became proud of myself, I realized I could become anybody. And I had teachers and role models who really supported me and encouraged me and gave me positive reinforcement. And I really just took everything in and set goals for myself that I was determined not to stop until I had achieved those goals. One of those goals that I had set in high school was that I wanted to become a lawyer, and here I am today. Nothing good in life comes easy. Nothing is brought to you without effort, without sacrifice, without sweat, commitment, and determination. So I would say your life is what you make of it. You're given everything within yourself, you have potential. And now it's like, when you have a flower garden, you plant it. You can't just leave it, you have to tend it with water, you have to make sure the sunlight gets to it, you have to nourish the garden, and then the flowers will grow and be beautiful. The same with life. So seek mentors, receive positive reinforcement, and just commit to your goal to work hard, and you will achieve them if you believe you can. NARRATOR: Scott Smith's profound deafness was diagnosed when he was 12 months old. Initially, his hearing parents were shocked. Two months after his diagnosis, Scott's mother introduced him to a small group of deaf people active in their church community. These early role models exposed Scott to sign language and deaf culture, and gave him the confidence that he could and would grow up to be successful. Scott was the only deaf student in his public high school in Winston-Salem, North Carolina. He was valedictorian of his senior class of almost 500 students. He received a full scholarship to attend East Carolina University, and continued his studies there to receive a doctor of medicine degree. Later, he graduated from Harvard University with a master's in public health. Scott's love for science and people has landed him a position in the world acclaimed Children's Hospital Boston, where he's a practicing pediatrician. INTERPRETER: I ride my bicycle. I like to ride a bicycle, go to my friend's house. I like to ride really fast to my friend's house. How far is your friend's house? It's really pretty far. Can you say the names of your friends? You know the names of your friends. Your friends at school. INTERPRETER: I try to raise expectations for deaf children. Deaf children should be able to do just the same things that a normal hearing child does. Often, many people in the field tend to have lower expectations, and they say, well, the child is a problem because he's deaf, and they kind of blame the deafness and use that as a reason for their child's problems, and often, that's not really true. It's because of the environment or what's happened to the child within their environment that contributes to whatever difficulties they're having. INTERPRETER: Which is your best friend? INTERPRETER: He's here for a general evaluation. Does he sleep through the night? He doesn't wake up? What do you think about when you see a child that's very-- that demands a lot of attention? INTERPRETER: I have a profound hearing loss in both ears, and that was at the age of around 12 months. Then at the age of 14 months, my parents tried to figure out what they should be doing with me. They didn't know. They were shocked by my deafness, and my parents wanted to know what to do with a deaf child. My mom was always saying her primary goal was just to be able to communicate with me. She wanted to be able to communicate with me. So my mom went to different doctors and speech pathologists and asked their advice, and it just so happened that at church they had a small group of deaf adults who had an interpreter with them. When my mother saw this, she decided to go up to the group and introduce herself and explain her situation, that she had had a son and recently found out he was deaf, and asked, what should we do? My mother asked the deaf adults what she should do. My mom asked advice from them and became good friends with two of the deaf adults, who were a married couple within the church. I consider them to be my godparents. My mom has pictures of me when I was, I think, three years old, dressed up in a doctor's outfit. So I guess you could say that probably it was something that started maybe that early. But because of the time that I grew up, it was not something that I obsessed about, because it was not something that was likely to be a possibility for me. But I knew that I wanted to do something big. I wanted to do something big with my life, just because my parents had given me that chance. But exactly what that was I didn't know, until I went to college. I became more interested in working with helping people. I really wasn't aware of some of the things that I was doing until I got into this situation, things that you take for granted when you're not used to communicating regularly with someone who is deaf. For example, I might walk down the hall and start saying something, and then I'd realize, no, I need to stop and turn around so that he knows I'm communicating with him, and make sure that his interpreter is available to sign what I'm saying. One of the concerns I had before Dr. Smith came to work with us was, I had no idea how he would examine a patient's heart and lungs, which every physician I know does by listening through a stethoscope. INTERPRETER: So people ask me, what's my secret? How did I do it? I can think of four major concepts that I would like you to think about today, especially you, the graduating seniors, and keep these in mind in the future. The first one is expectations, high expectations. The second one is perseverance, never giving up. The third one, empowerment. The fourth, balance. INTERPRETER: Many deaf young people have a difficult time with language for a variety of reasons. Like, they didn't happen to catch their deafness until later in life, or their parents didn't know how to promote proper language development skills for their children. But still, I believe that even though they're young, teenagers can still work hard to improve their language skills. And for me, the key was to take time to read and practice reading. Read as much as you can, because when I was young, when I was a teenager, I realized even though I'm pretty good in English, I still realized that because I couldn't hear, I was not exposed to a variety of words that were used regularly in the world. You live in a hearing world. You need to be able to be assertive and go up to people and meet them, because they will never come to you. Most people are just too afraid to meet a deaf person. And if you want to be able to do things with your life, then you really need to be able to be successful in networking and meeting people. I still struggle with that, even today. I still think, as I said, interpersonal skills really are key, and that's true for any doctor, but mostly so for deaf people too. Because as deaf people, we have to sell ourselves. And we have to make hearing people believe that we are capable, and we can do the job, and we can communicate, and that really takes a good personality. I would like to consider myself as a caring person, and a person with a good personality who most people when they meet me feel as though, hey, that's really a nice person, a person who I believe is capable of doing a lot of different things, regardless of whether he's deaf or not. Do you need a career role model? Then join host Dr. Robert Davila, vice president of the National Technical Institute for the Deaf (NTID) in this award-winning program (The Crystal Award of Excellence from The Communicator Awards, The Telly Award, The United States International Film and Video Festival Award, The Aurora Award, The Accolade Award, and The Media Access Award) as he introduces successful professionals who are deaf and hard of hearing. This program encourages viewers to set high goals, elevate their expectations, and become aware of diverse career and trade possibilities. Highlights Dr. Angel Santiago, optometrist, owner of EyeWear, Manati, Puerto Rico; Claudia Gordon, Esq., attorney at the NAD Law Center, Washington, D.C.; Dr. Scott R. Smith, a pediatrician at Children's Hospital in Boston, MA; and Dr. Kimberly Dodge, a veterinarian in West Hartford, CT. The first segment with Dr. Santiago is in Spanish with Spanish subtitles. Part of the "Achieving Goals! Career Stories of Individuals Who Are Deaf and Hard of Hearing" series.